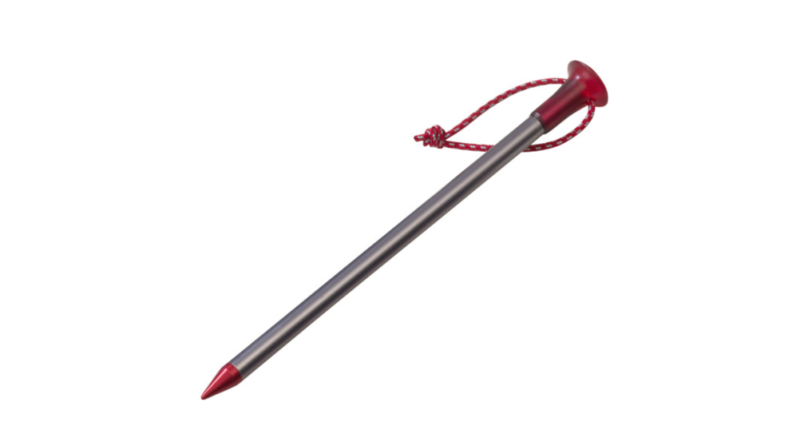 The first question that many people will ask is why would you buy such an expensive tent peg. This was a question I asked myself but after much debate I bit the bullet and purchased a pack of four to see how they would perform. Here’s why. These pegs weight just under 6 grams each and as such, throwing a couple of extra pegs in your pack that you may not need will not be noticed. Like many (but not all) MSR pegs these come with a reflective peg pull loop that makes these pegs stand out at night time meaning that you are unlikely to injure ourself if you kick them in bare feet. I’m a strong believer in carrying at least a couple of types of tent pegs on all my overnight camps. If you know exactly what the soil type is going to be like you can always bring the exact set of pegs you need. However in many cases on multi day trips you are likely to get a range of soils so having a few different types of pegs means that no matter what the conditions you will have a secure tent pitch. The other issue is that in really hard rocky soils many of the triangular pegs that come with many tents these days will bend and even break. I have one campsite that I regularly use in my local area and without fail I severely bend or even break at least one peg on each trip and even using cheaper pegs this adds up. I find that the MSR Carbon Core Tent Peg will grip in firm to hard soils and even when the soil is very rocky they will still penetrate the soils much easier than most other types of pegs including the fine wire style pegs. You will find reviews on the web where people have had issues with breaking these pegs but mine have survived quite well over the past six months of use in a range of soils that have destroyed other peg types I own. The only caveat here is that you need to use firm even strokes rather than trying to pound these pegs into the ground in one go. If you use brute force you will likely break them. While I wouldn’t recommend using these pegs exclusively unless the soil type dictates, I do carry anywhere between 2-4 of this type of peg in my standard kit and am happy to recommend them.